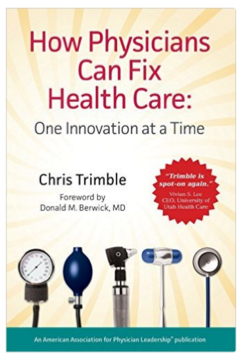 The book explains the role of physicians in the innovation process; they have to take the lead. Yet, Chris Trimble also acknowledges that most physicians have busy jobs. How to combine the two? The book provides nice examples how to combine today’s and tomorrow’s demands by building a shared and a dedicated team that work together on innovation projects. Chris Trimble also demonstrates the importance of experimenting, till the best solution has been found and proven to work. It explains very clearly that cost considerations have to be an integral part of the healthcare innovation process. Innovations that increase the quality of care, while reducing the costs of delivery are the type of innovations healthcare systems should strive for.